THE POE ADAPTERS ARE NOT INCLUDED WITH THE 5 PACK. The UAP-AC-PRO-5 UniFi Access Point Enterprise Wi-Fi System from Ubiquiti Networks is a scalable enterprise access point solution designed to be easily deployed and managed. It supports the 802.11ac Wi-Fi standard with speeds of up to 1300 Mb/s in the 5 GHz radio band, and up to 450 Mb/s in the 2.4 GHz radio band. The Wi-Fi system offers simultaneous dual band operation with 3 x 3 MIMO technology for each band. It has a range of up to 400' and two Gigabit Ethernet ports. This UniFi Access Point (AP) has a sleek design and can be easily mounted to a ceiling tile or wall, using the included mounting hardware. Using the UniFi Controller software, an Enterprise Wi-Fi network can be quickly configured and administered, without any special training. Real-time status, automatic UAP device detection, map loading, and advanced security options are all seamlessly integrated in the system. The UniFi AP comes bundled with a non-dedicated software controller that can be deployed on an on-premise PC, Mac, or Linux machine, in a private cloud, or using a public cloud service. Wi-Fi 802.11ac MIMO Technology. The 802.11ac MIMO Technology offers Gigabit speeds and range up to 400'. Install, configure, and manage all of the UniFi APs with the intuitive and user-friendly UniFi controller user interface. Build wireless networks as big or small as needed. Start with one or more and expand to thousands, while maintaining a single unified management system. Use the UniFi controller to provision thousands of UniFi APs, map out networks, quickly manage system traffic, and provision additional UniFi APs. You can use the configurable reporting and analytics to manage large user populations and expedite troubleshooting. Easy customization options for guest portals include authentication, hotspot setup, and the ability to use your own external portal server. Use UniFi's rate limiting for guest portal/hotspot package offerings. Apply different bandwidth rates (download/upload), limit total data usage, and limit duration of use. The UniFi AP includes hotspot functionality. It includes built-in support for billing integration using major credit cards, and built-in support for voucher-based authentication. A single UniFi Controller running in the cloud can manage multiple sites, multiple, distributed deployments, and multi-tenancy for managed service providers. Each site is logically separated and has its own configuration, maps, statistics, guest portals, and administrator read/write, and read-only accounts. The UniFi controller can manage flexible configurations of large deployments. Create multiple WLAN groups and assign them to an AP's radio. Upload map images of your location for a visual representation of each wireless network. UniFi organizes and visualizes network traffic in clear and easy-to-read graphs. With the UniFi controller software running in an NOC or in the cloud, administrators can extend and centrally manage the wide areas of indoor and outdoor coverage, using any combination of UniFi APs. Sleek wall or ceiling mount design (all accessories included). It has an industrial design with an LED provisioning ring or square, which provides administrator location tracking and alerts for each device. 2 x 10/100/1000 Ethernet ports. 3 x Dual-band antennas, 2.4 GHz: 3 dBi, 5 GHz: 6 dBi. Passive Power over Ethernet (48 V), 802.3af/803.2at Supported (Supported Voltage Range: 44 to 57 VDC). 2.4 GHz: 22 dBm 5 GHz: 22 dBm. Up to 4 per radio. WEP, WPA-PSK, WPA-Enterprise (WPA/WPA2, TKIP/AES). Voice, video, best effort, and background. 802.11a 6, 9, 12, 18, 24, 36, 48, 54 Mb/s 802.11n 6.5 to 450 Mb/s (MCS0 - MCS23, HT 20/40) 802.11ac 6.5 to 1300 Mb/s (MCS0 - MCS9 NSS1/2/3, VHT 20/40/80) 802.11b 1, 2, 5.5, 11 Mb/s 802.11g 6, 9, 12, 18, 24, 36, 48, 54 Mb/s. 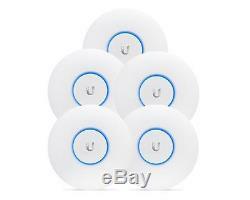 The item "New Ubiquiti UAP-AC-PRO-5 US UNiFi Access Point UAP-AC-PRO 5 PACK" is in sale since Wednesday, December 02, 2015. This item is in the category "Computers/Tablets & Networking\Home Networking & Connectivity\Wireless Access Points". The seller is "surveillance_depot" and is located in Mira Loma, CA. This item can be shipped worldwide.